"It's a lot harder than I thought it would be." This is one of the most typical comments of feedback we hear from students after their first few days learning how to surf. And after Calvin College students head to Manuel Antonio to learn this weekend, they will most likely be in agreement. Greg, a long-time surfer from California who works in Costa Rica Outward Bound's communications office, has this to say: "It's hard, but it's worth it." by now their experiences have made them two strong forces. Patrol 2 is making their way through the rainforest maze. while Patrol 1 has had some fun kayak spills. Patrol 2's solos allowed a LONG time for thinking. Patrol 1 learned knots to stop raft supplies from coming loose. tomorrow's waterfall rappel is part of this homestay. and now on Rio General they raft 'til Saturday. Calvin College participants are doing it all. What has Calvin College's Patrol 1 been busy doing? The same activities as Ticos, of course. From harvesting sugar cane and making candy to jumping in the river and playing games, Patrol 1 has done it all. Up until yesterday when they ended the Land Phase and began the River Phase, Annie, Jean, Laura, Casie, Thomas, Luke, Mark, Kathryn, Ryan, Glen (the professor), Chris and Jake had been roughing it in the rainforest. Activities consisted of farm work, learning how to cook food from scratch, waterfall rappelling, swimming in the Lopez's river, camping, and community service. This hard work comes at a cost: many of the students suffered minor blisters from the heavy work of sugar cane harvesting. But any ampolla here and there is worth the pain when it means making candy in the end. Candy was not the only food they made from scratch. After milking the cow, they made cheese. After grinding the corn, they made tortillas. After gathering eggs and bananas, they made bread. It is an understatement to say that these Calvin College students are getting in shape. Not only that, they helped with flattening and expanding the rainforest paths between two of the homestays. This act of service is greatly advantageous to the villagers living in the area who use these paths to transport items to and from their remote homes. Thanks to their work, paths are safer now for horses, too. Overall, their Land Instructor, Mauren, had great things to say. "Disfrutaron mucho," she said with a huge smile. ("They enjoyed it a lot.") "Y no puedo creer como despabilados son," meaning that the group is incredibly bright and ready to face any challenge. Already they're beginning to sound like indigenous Ticos. Now it's Patrol 2's turn to work on their Costa Rican cultural immersion. Twelve of Calvin College's students (Patrol 2) conquered 40 km of Costa Rica's challenging 60-kilometer Río General (see below) in a 3-day River Phase extravaganza. Ryan, Kevin, Brian, Kelsey, Lauren, Katy, Rachel, Ted, Kyle, Trent, Alex, and Andrew accompanied three of Costa Rica's best (at least, by word of mouth) rafting guides: Felipe Lopez, Joe Ewing, and Antonio Lopez. Their skills rubbed off on the Calvin College crew. Not only did all students learn to roll, but three of them completed the entire 40-kilometer stretch in hard shell kayaks! "I'm like a proud parent at a dance recital," Joe reported later. The students were enjoying it so much, in fact, that they all decided to get WRT (Whitewater Rescue Technician) certified in those three days. 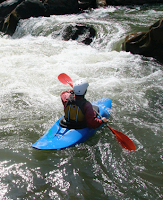 On class III-IV rapids, they worked hard to complete every skill necessary for this reputable certification. All that's left is a 25-question test which they will complete at the beach camp next week after finishing their Hiking Phase. It was obvious the students never wanted to leave the river. But all good things come to an end, right? Luckily for them, however, more good things begin for them today in a different part of the rainforest. The other half of the Calvin College group, Patrol 1, will begin this river phase next week on the 18th. We'll see if they can keep the score high for Calvin College. Did you catch any of that? Neither do most people, which is why we leave it up to the rafting professionals. Fourteen of Central America’s finest rafting gentlemen met for over six hours today to discuss standardization of rafting certification guidelines. Those in attendance were representatives and president (Rafael Gallo) of the International Rafting Federation (IRF), rafting guides and executive director (Bradley Jim Rowe, PhD.) from the Costa Rica Rainforest Outward Bound School (CRROBS), and guides and owners from other major Central American rafting companies. In addition to standardizing the instruction, another hopeful outcome of these series of seminars is to give the IRF more credibility. All rafting guides will now share how they teach their Swift Water Rescue and Rafting Rescue courses in addition to becoming stricter with the certification process. Instructors will be required to sign off on specific skills, number of days rafting, and experiential tests. The standard for CRROBS raft training now is a rigorous 20-day instruction which includes four days of Whitewater Rescue Training (WRT) through Rescue III International and 16 days in rivers all over Costa Rica for more extensive training and experience. In addition, CRROBS requires CPR, WFR (Wilderness First Responder), and TRRO certifications. It is for this thorough process why the IRF has sought CRROBS’ involvement in the new structuring of guide regulations. It meant a lot for the thirteen men in attendance to have IRF’s president, Rafael Gallo, present at the meeting. “Seeing his ambition for improving IRF’s standards and the direction of rafting as a recognized sport really helped motivate us to take some action,” stated Joe Ewing, another CRROBS rafting instructor. Gallo, too, was excited to begin these meetings, saying “We are trying to focus on certifying people as guides because the focus currently is on rafting competitions.” Now it’s getting back to the basics and the important parts of rafting and instruction. This isn’t to say that rafting competitions are not going to be a focus in the upcoming year. Costa Rica Outward Bound employees are already getting a team together for an IRF competition this coming summer. All CRROBS instructors who attended the seminar – Daniel Jimenez, Felipe Lopez Salazar, Joe Ewing, and Carlos Grenados – left the meeting excited about their strong CRROBS team of rafters. The next meeting is scheduled for mid-November, again at Costa Rica Outward Bound’s base, to begin to specifically document the standards for raft instruction through which all guides must pass as official IRF instructors. Costa Rica Rainforest Outward Bound School (CRROBS) is an experiential education program designed to inspire and develop leadership, compassion, responsibility, respect for the environment and commitment to serve through adventure-based wilderness experiences in Costa Rica, Nicaragua and Panama. "Between 40 min and 2 hours; it depends on the time of day, the day of the week, and the time of year." This is the response we give when we're asked, "So how far is the Costa Rica Outward Bound base from the airport?" We never know, either. When scheduling our drivers for student fly-ins and fly-outs, we allow between 1.5 to 2 hours for our team to have enough time to be at the gate with the welcome surfboard before picking up students or dropping them off. What causes those pesky delays? Construction. Rush hour. Festivals. Rain. Trucks. Fog. It is quite easy for traffic to form in a country whose highways are two lanes on each side, and all other roads are one lane in each direction. This is why we have to go through our "checklist" of items so many times before the airport journey: we're too far away to go back. But rest assured, we will have that surfboard in hand to welcome the students (see right). To read more about flight planning and logistics when getting a student from home to our Costa Rica base in San Ramon de Tres Rios, go to our travel page of our site. About: Danny loves cars. In fact, he owns one right now that is quite popular. It catches ears and eyes with both its distinct bright lime green color and deep muffler hum. Danny has hurt his knee multiple times playing his favorite sport, soccer, but that hasn't stopped him yet from rafting, hiking and kayaking. About: As our Logistics Manager, Antonio lives on base with us, long distance from his 17 brothers and sisters (most of whom work with us as instructors, too). Known as the loco of the family, he loves to test his kayak skills in the white water of Costa Rica's most dangerous rapids. 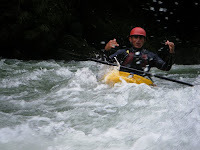 About: Joe is Costa Rica Outward Bound's new River Manager. 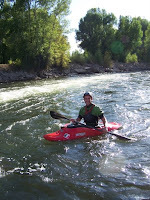 He has had years of experience on the river, including when he attended Colorado's Outward Bound High School and guided for Outward Bound Mexico. He has always been active, playing football since he was a kid. About: Also one of the 18 López children, Felipe is known as one of the more serious and talkative sons. But that's to be expected, as he is also a husband and a father of two precious toddlers. About: Unbeknownst to his students, Carlos' dreads and surf moves hide the fact that he was once an IT businessman. He now focuses his non-surf time on fixing up cars to resell them. With the way his students love him and his instructing style, it's questionable as to why his nickname is "Diablos" (meaning "devil"). 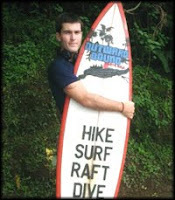 About: Jim started Costa Rica Outward Bound with his own two hands, but it began in 1992 as a simple adventure school. To get this project started, he lived out of his car, leading rafting and SCUBA trips to tourists. Now, 16 years after being awarded the Outward Bound charter, he works on base as the Executive Director.